I like how WHITE those thin little clouds are! Nice photo for SWF. Love the way you capture the flag flying in the sky. Have a nice weekend. Lovely, wispy clouds! Great shot! Thanks for sharing! Have a great weekend! Flag shots sometimes make the best photos, yours is outstanding. Beautiful. 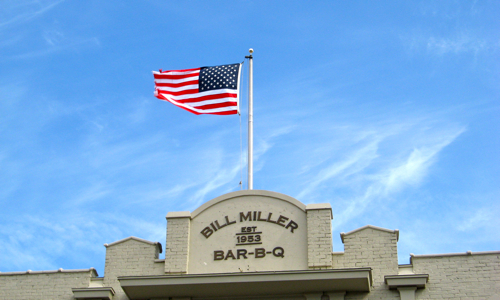 The flag really pops out against the gorgeous blue sky…and how is the bbq? By the way, I too posted flags for SWF!